(or should exist) between fans and artists/bands/labels. The record I purchased was Quiet Life’s Wild Pack & the label it came from was Mama Bird Recording. There are links at the bottom of this post that’ll allow you to go find out more about this Portland, Oregon label & their family of bands… but I’m here to talk about the time, care, and personal touch that they put into their products. In this digital age of instant gratification, this is something that fans should truly appreciate and something that other bands & labels should learn from. (or compact disc) from its sleeve. I truly love it. I always have. Mama Bird Recording takes that experience one step further. Like I said, I was looking around to read up on Quiet Life’s new record & was jumped to their label’s Bandcamp page. If you’re not familiar with Bandcamp, it’s a customizable microsite for artist/label promotion & music sales (you can read more about it HERE). It’s great. It is ESPECIALLY great for independent artists like myself. You should check it out. 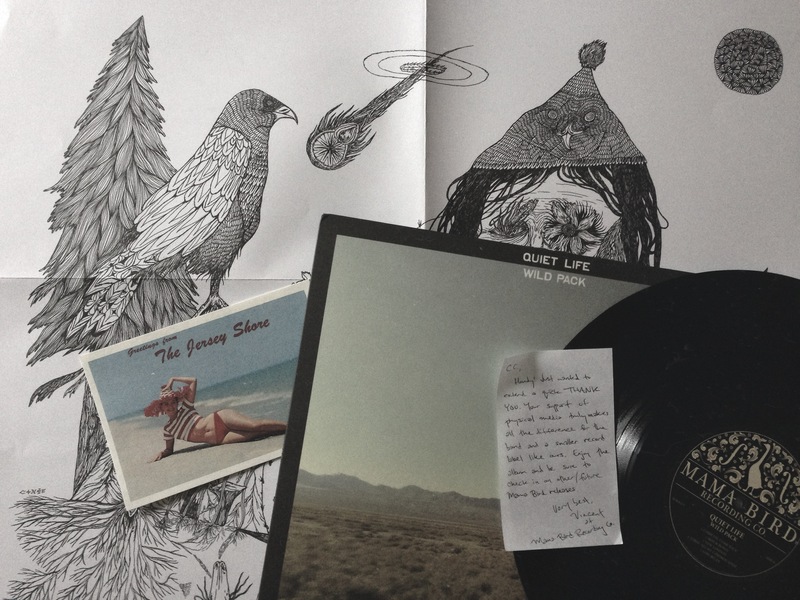 At any rate, I chose to forgo iTunes and purchase Quiet Life’s new record, Wild Pack, on vinyl. Of course, the record came with an immediate digital download upon purchasing the vinyl (to satisfy my inner modern consumptionist). Hand-written note from Vincent at Mama Bird Recording Co.
Howdy! Just wanted to extend a quick THANK YOU. Your support of physical media truly makes all the difference for the band and a smaller record label like ours. Enjoy the album and be sure to check in on other/future Mama Bird releases. Vincent at Mama Bird Recording Co. This is where artists, bands, & labels should take notice: I firmly believe that it is the personal touches added to products that build relationships with fans. In business, there is an idea of “added value”. This means adding something extra to your product that is of high value to your customers (your fans), and relatively low-cost to you (artist/band/label). You are your product. You are of value to your fans. Add a little bit of yourself to things. There is such a thing as “brand loyalty” when it comes to music, and you are your brand. Cultivate your personal touches. Connect with fans in new and nontraditional ways. Respond to their tweets. Read their fan emails. Answer their fan emails. Sign everything you can. Don’t take their fanship for granted. Be a human, and be thankful and humbled every day that anyone gives a damn about what you’re making… because some day, no one will. This is where fans should take notice: Physical media is the most profitable (per unit) media for your average artist, band, or label. Especially if that artist, band, or label is unsigned or independent. Although some physical media sales, such as vinyl & cassette tapes, are on a slow rise… their sales are still dwarfed by digital sales. The Galleywinter motto is “Support Music You Love”. Nothing supports music more than buying it. Not Spotify, not Pandora, nothing. Purchasing music supports music. Period. And for this to be the norm, rather than the exception. Fans: Keep supporting. Buy music. It’s what keeps artists creating things that you love. Aristis/bands/labels: Add value to your products. Be human, not lifeless profit machines. Quiet Life’s “DEVIL’S KIN” from their album, Wild Pack, on The Drop. Here is a link to the MAMA BIRD RECORDING family of bands. I can tell you that since receiving my Quiet Life order from Mama Bird, I’ve also purchased the DENVER and BARNA HOWARD records & I highly recommend them for the Galleywinter faithful. Good job. I reiterate: Good job. I’ve never bought a vinyl.. I would if I had a record player.. But I do enjoy a good CD every now and again. If my car had a CD player, I’d have more of them. Thanks, man. I’m biased to vinyl… but then again, I’m a snob. Appreciate you reading the article! I agree with you. I know a lot of folks who use things like Spotify to listen to things they’ve previously purchased or purchase things after hearing them on spotify. I’m not inherently against these services. I just think they shouldn’t be your only way to listen to music. If you like something & want to listen to it a lot, buy it. Simple. Love Hogwild. Frequented there quite a bit when I lived just south of San Antonio. Glad to hear they’re still open. Thanks a lot for reading & commenting! Great article!! I agree 100% as a fan of music I have a huge vinyl collection an always support independent artist,labels and stores. Also as a musician lookin to record my first record sometime next year hopefully I would appreciate the small things an feedback as I try to develop a fan base! Thanks, man. Appreciate it. And good luck on that rekkid! Thanks for the great comments, folks! THIS is what bring part of a music community is about. Chris, your perspective is right on. I have almost exclusively looked for the experience when purchasing music. Whether it be going to a show then going to the merch table to get the latest album or buying it from a local record shop. I look forward to seeing what you have in store for your fans on your next album. I know I’ll buy it! Thanks, Josh! I’ll actually be doing a couple of digital releases until I scrape up the money to go back into the studio. But I assure you, there will be physical copies of the next studio album. And it will be fun. Thanks so much for this article! Many of my friends don’t understand why I still buy CDs (I’m sharing this with them). Some CDs are just plain fun, too–Reckless Kelly’s last two albums, for example. YOU’RE WELCOME so much. And thanks for sharing this with your friends. Really appreciate it! And yes, RK’s last couple albums are great. And they were done by some great girls at Backstage Design in Austin. Can’t forget the simple joy and anticipation of waiting a couple of days for it to go through the mail, it finally showing up at your mailbox, and then having to unwrap the package just to finally hear what you bought compared to clicking download or buy. Exactly. The anticipation & wait for a new vinyl to come in the mail is incomparable to downloading something. Great article! My brother and I were talking, just a week ago, about purchasing physical copies of albums. We’re big fans. Don’t get me wrong, I love iTunes and I love my iPod (it is my actual favorite possession) but there’s something about holding an album and flipping through the booklet that comes with a CD. I love those; with the lyrics and the photos and the musician info. You don’t get those through iTunes. Thanks, Selena! The ease of iTunes is a wonderful thing. But yes, physical media is where it’s at. iTunes allows bands to include digital PDF booklets for their albums, but not enough artists utilize that… especially lesser-known artists. Loved this read. I’m a loyal tangible media buyer..but appreciate the capability to grab and buy a song for a buck when I need it “now”! ;) We live in good times. Exactly, Cathy. Thanks for the loyalty! We do live in great time. Thanks , I’ve just been searching for info about this topic for a long time and yours is the best I’ve found out so far.However, what concerning the conclusion? Are youpositive in regards to the source? I simply want to mention I’m very new to blogging and seriously loved your website. Very likely I’m going to bookmark your blog . You surely come with tremendous articles and reviews. Thanks a bunch for sharing your blog. I¡¦ve been exploring for a little bit for any high-quality articles or weblog posts in this kind of space . Exploring in Yahoo I ultimately stumbled upon this website. Reading this information So i am happy to convey that I have an incredibly good uncanny feeling I came upon just what I needed. I so much surely will make certain to do not overlook this website and give it a look regularly. Great remarkable issues here. I¡¦m very happy to look your article. Thanks a lot and i’m having a look forward to touch you. Will you please drop me a mail? Thanks for another magnificent article. Where else could anyone get that kind of information in such a perfect means of writing? I have a presentation subsequent week, and I’m on the look for such information.